Hardback. Japan had been widely regarded as one of the safest societies in the world. That illusion was shattered, however, on March 20, 1995, when a deadly nerve-gas attack in the subways of rush-hour Tokyo killed 11 people and seriously injured 5,500 others. After a few days of widespread public terror and confusion, the Japanese police identified the perpetrator as a small religious group called Aum Shinri Kyo, or Aum Divine Truth. Searches of Aum compounds around Japan, arrests and confessions of members, and a rising pile of evidence of the manufacture of chemical weapons by the group, finally led to the arrest and trial of Shoko Asahara, the sect's guru. This is an up-to-the-minute account of the first ultraterrorist attack in Japan directed at civilians. The story of the rise of Shoko Asahara and the creation of his cult is told in detail, from his childhood in a school for the blind to his early years as a yoga teacher, his visits to India and meeting with the Dalai Lama, his brilliant manipulation of the Japanese media, his venture into politics, and his growing paranoia and obsession with the approach of Armageddon. The author gives a minute-by-minute account of the Tokyo attack, as 5 members released the gas on trains heading toward Tokyo's heart. He details the massive police investigation, the accompanying media circus, the arrest of Asahara, the trials, and the stream of confessions that poured out - a horrifying list of atrocities preceding the attack that included kidnapping, torture, murder by injection, strangulation, and immersion in scalding water, and disposal of victim's bodies in a commercial microwave specially adapted for the purpose. 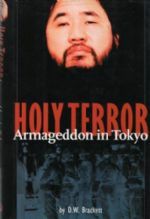 The book answers the questions that the Japanese and the rest of the world were asking about this horrific act of ultraterrorism: what spawned it, and how can we protect ourselves against it? Illus. Epilogue, Bibliog. and Index. 206pp. 8vo. h/back. From the library of true crime writer, Wilfred Gregg, with his personal b/plate. F. in F. dw.